USDJPY - at the lows today - held above the old ceiling. Buyers remain in control. The USDJPY is also in a down and up market as the pair continues to consolidate the sharp move up at the end of the week last week (from 110.838 to 112.09). The pair since the high has traded down of 111.835. That is just above the old ceiling at 111.79-817 area. Support held and the price moved back higher. The pair has stalled against a topside trend line at 112.03 and below the 1.1209 highs (double top). So technical levels are holding. The problem is 111.83 to 112.03 is only 20 pips. That ain't a lot of price action. The price will not stay that confined for long. There will be a break at some point. Given the run higher higher from last week and the holding of the old ceiling on the correction, I have to give the nod to the buyers as long as the ceiling can hold. Traders would have more confidence the longer that support level holds. Looking at the daily chart, the pair based last week near the 100 day MA and moved above the 200 day MA as well (green line). The pair has the 112.076 to 112.279 area as an area to get above. 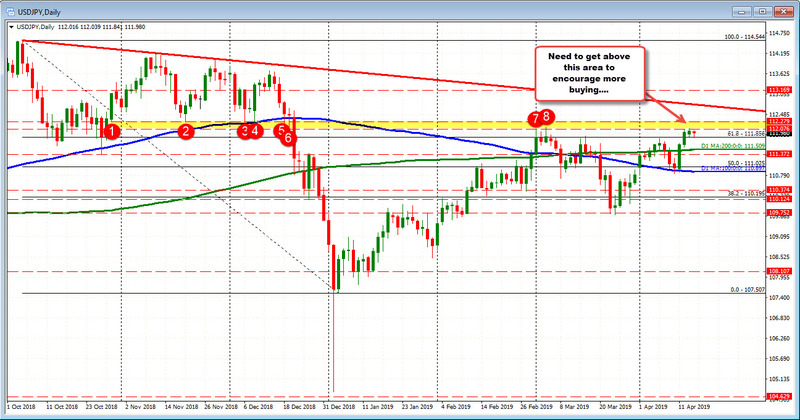 That is upside target now for the pair (see chart below).